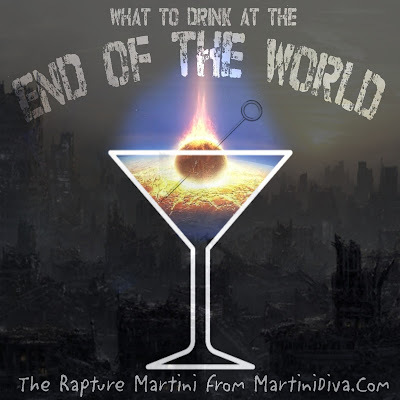 For those of you who buy into all the doomsdayer propoganda and think the world is going to end today or tomorrow or the next time some crackpot misreads some biblical text and proclaims the end of the world, here's your (updated) apocalypse cocktail. Shake ingredients in a cocktail shaker, strain into a chilled martini style cocktail glass and serve. Sadly, Forbidden Fruit Liqueur, which I originally used for my Rapture Martini is no longer made. I admit my bottle was a gift given to me as a joke on a long past birthday. It was a cool curiosity so I kept it, but it sat around gathering dust for years until all the brouhaha over some hayseed preacher's apocalyptic predictions went viral in 2011. 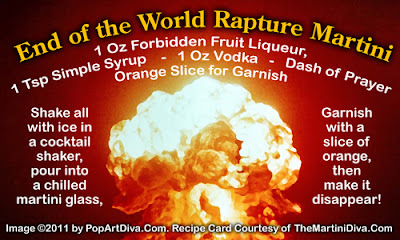 Interestingly enough it was still palatable, even decent, and perfect for a doomsday drink. When I see what some unopened bottles are selling for on eBay, I now wanna slap myself for opening the bottle. If you'd like to try that older recipe, here's one recipe for Forbidden Fruit Liqueur by Eric Ellestad over at Savoy Stomp. Here is another recipe made with actual pomelos, the main citrus originally used in Forbidden Fruit Liqueur. I make no guarantees on these recipes because I haven't tried either of them, but go for it if you're of a mind to taste some forbidden fruit. For the rest of us who figure we're going to be around for a while yet, bookmark this site for new cocktail recipes every week. Bless you, my booze guzzling children, may the spirits speak to you in heavenly voices - the spirits of vodka, rum, gin, tequila & whiskey that is.